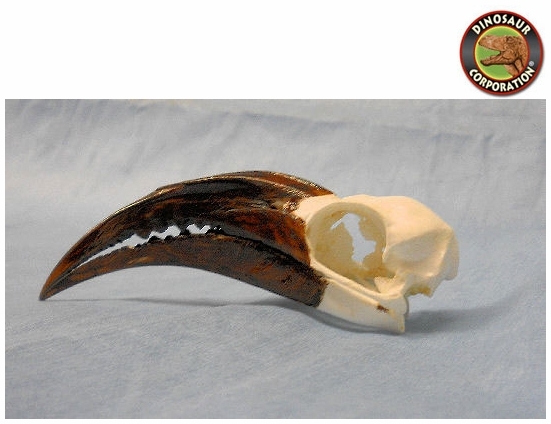 African Grey Hornbill Male Skull. Tockus nasutus. I Polyurethane cast of a private collector. The African Grey Hornbill (Tockus nasutus) is a member of the hornbill family of tropical near-passerine birds found in the Old World. It is a widespread and common resident breeder in much of sub-Saharan Africa and into Arabia. At 45 centimetres (18 in) in length, this is a large bird, although it is one of the smaller hornbills. It has mainly grey plumage, but the head, flight feathers and long tail are a darker shade. There is a white line down each side of the head and one on the back which is visible only in flight. The long curved bill is black and has a small casque and a creamy horizontal stripe.